Arsenal’s veteran goalkeeper Petr Cech has vowed to ‘fight’ for supremacy between the sticks next term following the arrival of German stopper Bernd Leno, despite recognising the growing interest for his experienced services from foreign clubs, including, most notably, SSC Napoli of the Italian Serie A.
Leno, 26, joined the Gunners for a reported £20m from Bundesliga outfit Bayer Leverkusen in June and it’s believed that Unai Emery would favour the VfB Stuttgart product over the former Chelsea keeper, however Cech isn’t about to give up his once undisputed starting spot without a battle. Napoli are supposedly in the market for a replacement for Jose Pepe Reina, who’s poised to depart the Partenopei in the summer, and Cech has allegedly been identified as a serious contender to potentially take the batten from the equally qualified Spain international. 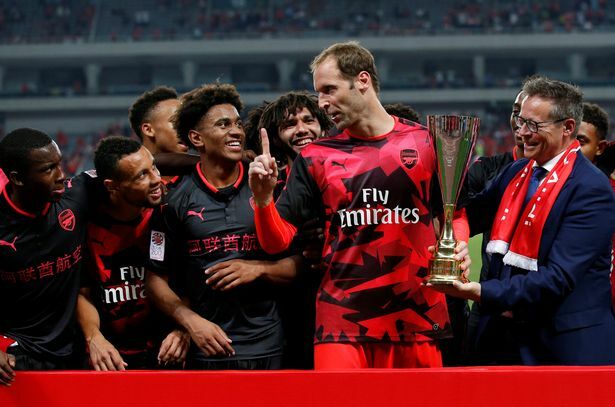 Cech has one year remaining on his standing deal at the Emirates and is determined to honour his contract with the north-Londoners as the club’s trusted No.1 during the imminent 2018-19 campaign, a statement of serious intent. Speaking to the media – via Daily Star – the Czech ace conveyed his desire to remain a Gunner for at least one more year and is prepared to push Leno, who’s a decade younger, all the way. “Napoli were interested in me, but my future is at Arsenal and I do not think about changing clubs.” He said. Cech jumped ship from Chelsea to Arsenal in 2015 for £10m, and has since claimed 117 appearances as well as one FA Cup and two Community Shields, testament to his influence within the penalty area as part of the club’s defensive regiment. Share the post "Petr Cech will ‘fight’ for supremacy next term despite foreign interest"